Last week, GTA Online added 4-player cooperative heists. If you've been waiting until now to hop in and start playing, I've got a tip that'll make it much easier to survive your first big score: Pack lots of snacks. In some ways, GTA Online works just like the regular, offline GTA V. The map is the same, the guns are the same, the cops and civilians act the same. Sure, there are human-controlled psychos everywhere, and they'll kill you as quickly as possible (unless you turn on Passive Mode), but for the most part: It's GTA V, just online. The one big difference is that your character now has an inventory. That means that you can store various items and access them mid-mission. To access your inventory, you'll want to access the interaction menu, which you can do with the view button on Xbox One or by holding down the touchpad on PS4. The two most important things you can carry are snacks and body armor. You can buy snacks at any of the game's many convenience stores, which are marked on your map with a weird-looking "store" icon. Before you do any heist mission, head to the store and stock up on every type of snack you can carry. If you access your inventory while in the midst of a mission, you can wolf down snacks to replenish your health, which makes some of the longer heist missions much more survivable. 1) Eat snacks while in cover. If you do that, you won't even have to wait through a snackin' animation, meaning you can quickly pump your health back up. You can also eat a snack while riding in a car, with no animation. 2) Assign "eat snack" to your Action function. Then, you'll be able to click both thumbsticks and eat a snack anytime. It doesn't work while in cover (as far as I can tell), but it does work other times. You can also carry unused body armor. Be sure you're wearing as much body armor as possible (a full blue bar) before starting a heist, then go to Ammu-Nation and buy as many sets of body armor as you can carry. Then, in the middle of a mission, you can go into your inventory and re-equip your spare body armor to get your blue bar built back up. 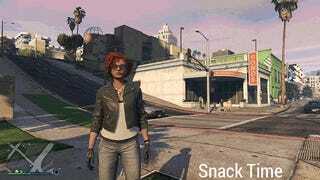 One of GTA Online's loading screens helpfully tells you all about snacks and spare body armor, but it's easy to miss. So, I figured I'd share, on the off-chance that some other newcomers don't yet know this stuff. Evan and I have been working our way through the game's first few heists, and we'll have more coverage and thoughts on Kotaku soon. In the meantime, if you've got any other tips for GTA Online heists (or actual real-life heists), I hope you'll share 'em below.